The Crazies (1973) Between Night and Dawn Edition Review – AiPT! If you’re a die-hard Romero fan, maybe you’ll find something worthwhile here. Less than a year ago legendary director George A. Romero passed away. His best and most well known films, Night of the Living Dead and Dawn of the Dead, veritably defined what a “zombie” is in cinema. You may also know of his other “Dead” films and sequels, but most of his early work and other films outside the zombie genre are obscure and unknown. The boxed set, Between Night and Dawn, includes the three films he made between “Night” and “Dawn”: There’s Always Vanilla, Season of the Witch, and The Crazies. The Crazies stood out to me, since I had seen and liked the 2010 version starring Timothy Olyphant. In fact, I didn’t even know it was a remake of a Romero film until I saw this box set. So how does the original version hold up against Romero’s other work? Is it good? The plot of both the old and newer version of the film are relatively the same. A plane carrying an untested bioweapon crashes near a small midwestern town, contaminating its water supply. The people begin to succumb to the effects of the bioagent, code named “Trixie”, which either kills them or turns them into homicidal maniacs. The army is aware of the danger, so they quarantine the town and its people to contain the spread of Trixie. Of course they don’t explain any of this to the townspeople, who they try and corral into the local high school in order to see who is infected. But this is the midwest and America dammit, where you can’t just go shoving people into schools no matter what your rank is, so conflict ensues. What follows is nightmare scenario where a small group of townspeople have to fend off shoot-first soldiers and the titular “Crazies”, while wondering if anyone in their group is showing signs of infection. At least that’s what the synopsis of the film says. The 2010 version mostly gets these beats right. The original, however, expands the military side of the conflict, giving more screen time to the officers in charge of containing Trixie and a scientist they bring in to try and develop a cure. Perhaps Romero meant to make these characters more sympathetic, but it only succeeds in pulling our attention away from where the real conflict and tension should be. The group of survivors the Romero version focuses on is centered around firefighter David, his girlfriend Lucy and David’s fellow firefighter, Clank. I didn’t look it up, but I’m pretty sure none of these actor’s performances garnered any awards. They’re about what you would expect for a 1970’s horror film with a micro budget, but given that Romero had already made “Night” by then, with a similarly non-existent budget, and gotten far better results, it’s still a little disappointing. I’d remiss in not mentioning the over the top performance of Richard France who hams it up as Dr. Watts the scientist who is desperately trying to find a cure. This guy has another gear. It was like David Gale’s performance in Re-Animator, except Gale seemed to be in on the joke and played to the camera purposely. If you were at least expecting some good and gory scenes, you’ll be disappointed too. 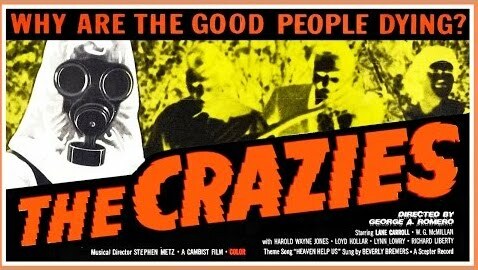 I’m not a big gore-hound, but you kind of go into a movie called The Crazies expecting “the crazies” to act crazy. They mostly look high. Or extremely dumb all of a sudden. They mumble and stare and except for a few standouts, such as the old lady who stabs a guy with a knitting needle and another woman sweeping bloody grass, you get the feeling they’re not that dangerous. It’s a huge missed opportunity as the idea of seemingly normal people turning murderously violent and not knowing who is infected (or not) should have been the keystone and most interesting thing about the movie. Instead characters stare at other characters when they aren’t paying attention, for long, thoughtful moments, where I can just imagine them thinking, “Man, I wonder if he’s crazy?” Without a scarier result, it didn’t really make me feel characters were in that much danger. Ehh… not so much. If you’re a die-hard Romero fan, maybe you’d find something worthwhile here. For everyone else, it will be little more than a curiosity, prompting the phrase, “Romero made this?” Despite a decent premise to work with, nothing promising ever really materializes. There are some moments of tension, but they ultimately don’t lead anywhere and fizzle out rather than explode. The 2010 remake had its own problems, but still handled the material much better, focusing on building suspicion and the isolation the survivors have to deal with, along with some pretty crazy Crazies. If you’re interested in the plot, give that one a look and let the original rest in peace. Romero has worked magic with a small budget before, but not in this original version of The Crazies, which feels like a solid idea that was poorly executed. Not as bad as There’s Always Vanilla and Season of the Witch (also included in the “Between Night and Dawn” set. The “crazies” are never really shown to be that much of a serious threat. The low budget really shows, with rough editing, flat acting, and a poor soundtrack.